It is unusual, maybe counter-intuitive, to be reviewing an album recorded and released in November 2012, but this one managed to fall so completely under the radar, it feels worth doing. I found the disc by surprise while on holiday, flicking through the fado shelves of the Companhia Nacional de Música in the Rua Nova do Almada in central Lisbon, and the album has frequently stayed on repeat play since then. The fact that seems to have escaped the attention of just about everyone whom I thought might be aware, is that the eminent classical pianist Maria João Pires collaborated in 2012 with a major figure in Portuguese music, the veteran singer Carlos do Carmo, to make a remarkable album of fado songs. 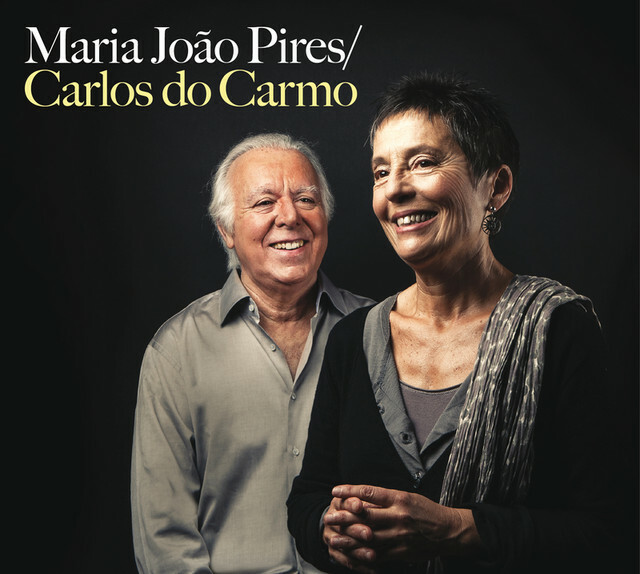 Fado can be one-geared, these are all songs of regret, but Do Carmo's experience of story telling, and Pires' genius pianism make this an edge-of-the seat disc, and one with subtle surprises all the way through. The songs are all compositions by the Portuguese composer and pianist António Victorino de Almeida (born 1940). They are settings of several different poets. The composer is of the same generation as the singer (born 1939) and Pires herself (1944). All three are from Lisbon; for Pires this is a return to her roots. The disc consists if a short programme of nine songs, in total lasting less than half an hour, but six of the nine songs are also available on the DVD - the video sequences were rehearsals for the audio. The audio CD and the DVD come as part of a lavishly produced set. There is a 24-page full colour booklet with photos from the sessions and all of the words - in Portuguese only (more pictures of the set here). What is so remarkable? Pires' constant variations in pace and mood following the speech rhythms, her sheer variety of piano touch and texture. That aspect of Canto Três - for me the most perfect take, desert island stuff - was the first thing that really struck me. In that song, as elsewhere, the shared instinctive sixth sense of how a story should unfold is magical. A wonderful moment occurs near the end of Teclado: it feels like Pires could easily drift off into the half-light of Debussy's Clair de Lune. Similarly the vivid scene-setting at the opening of Separação could be about to tell the story of The Maiden and the Nightingale from Granados' Goyescas. There are some rare occasions when Do Carmo's voice feels a bit strained, but for the assurance of his narration, for the vividness and beauty of the language, those are minor blemishes. There are moments when maybe the limitations of the composer emerge - the ending of Sem Palavras has a certain irredeemable silliness about it - but that is true of real life too. Followers/fans of Pires (I gladly own up to being both) are becoming used to expecting the unexpected from her. She is above all a generous spirit. She has emerged strengthened from financial and health problems in 2006 - SEE THIS INTERVIEW. The last time I wrote about her, (HERE), it was in her role as one of the master musicians at the Chapelle Musicale Reine Elisabeth south of Brussels. She was the uncontested star of the institution's 75th birthday concert, but chose to make her entrance on stage on that gala occasion... as a page-turner. It was a symbolic gesture which showed both her humility and her commitment to the institution. Her most-watched VIDEO is one where she discovers to her surprise and shock during the orchestral introduction to a Mozart piano concerto in the Concertgebouw in Amsterdam that she has prepared the wrong concerto. A disc to enjoy and to keep - or to ask for for Christmas!